Most people find Gmail confusing because they don't understand basic features like labels, archiving, filters. So you'll hear them asking for folders or wondering how to remove messages from the inbox. This knol written by gravi_t, an active member of the Gmail group, does a good job at explaining the features that make Gmail different. - there are default labels, like "Inbox", "Sent items", "Trash" ("Bin"), "Spam"
This means that - unlike in other email services - you do not put the emails into folders. You actually attach labels to the emails. This is why your email disappears from everywhere when you delete it; because deleting the email means deleting the "piece of paper"!! The knol is licensed as Creative Commons Attribution-Noncommercial and Google should use some of its content in the "welcome" message. Tip: To find when you created a Gmail account, go to "All mail", click on "Oldest" and you'll see the first messages you've received. You'll need this information to get access to a compromised Gmail account. Lol, I loved GMail since day one. I converted only a hand full of people. Your first paragraph sums it all up, "Most people find Gmail confusing because they don't understand basic features like labels, archiving, filters. So you'll hear them asking for folders or wondering how to remove messages from the inbox.". subject Gmail is different. Here's what you need to know. That's how Opera's mail client (called M2) works. "each email is a piece of paper" By default, pieces of paper don't have notes on them. When I look at my desk, I can see which ones have no notes on them and which ones do. So, how can I find the emails in gmail that don't have labels? Without that one feature, I cannot use gmail along with any automated notification system, email discussion list, etc. because I would have no way to filter the automated emails which are easy to label from those emails that are most important but least easily labeled because they're written by human beings instead of pieces of code. Putting notifications, for instance Google's own Sites notifications, into a single "thread" is also horribly wrong. Today's update to PageA is not part of a conversation from last year's update to PageA, at least not in my view. It's not because we don't understand labels that we want folders, it's that we simply just want folders! Labels != Folders. I have caught every one of the people I have converted to Gmail using the delete function instead of archive. What if you've already deleted the first piece of mail you ever received? Yahoo mail is better, but it didn't get better until after I got used to using Gmail. Dragging and dropping to a folder is easier, quicker, and more useful than labels as far as I can tell. I don't often use labels and don't find that the ones I do use offer any great benefit. I do delete mail. Every day. I guess I should really switch back to Yahoo. In my opinion Gmail is great. The problem is that everyone wants their mail every place they go. It would be nice if their was a way to make Outlook handle Email the same way as google. It would also be nice if their was a CROSS PLATFORM mobile client which handled Gmail properly. If everything was uniform perhaps it would be a bit easier to seamlessly work gmail. Actually, if I understand Creative Commons correctly, Google couldn't use text from the Knol article without specific permission from gravi_t. Google is a commercial entity, so its use of the text - unless specifically permitted in writing by gravi_t - would violate the "non-commercial" aspect of the license. No, the default labels are like folders, because a message can't be in the Inbox, All Mail, Spam, and Trash at the same time. Not quite. Gmail excludes from most views the messages labeled as Spam and Trash, but this is just a display issue. A message can be in the Trash and still have custom labels. The most significant limitation is that if you mark as spam a message from the Trash, the Trash label will be removed. I used GMail for years and I still delete email often. Sure it's unlimited space, but that doesn't mean you need to be a packrat and save emails that will never have any use. What workarounds, kludges can people try who prefer sorting their gmail inbox alphabetically by subject?... besides forwarding copies of incoming messages to Yahoo! mail, saving the gmail copy in the gmail inbox. gmail is ridiculous confusing for sending replies or for forwarding. It is impossible to know which 'send' relates to which of the emails, stickies, whatever. Why can't the designers ensure that the 'send' button is crystal-clearly attached to a particular mail - instead of sitting between two mails, etc? It's the forwarding and replying of emails that confuses me too. I'm scarred of forwarding an entire thread of a conversation to somebody who I don't wish to see part of the thread. I'm glad I found this because I can't seem to get the hang of Gmail, either! The comments above about labels and folders do help me somewhat, though I still want my folders. I can "see" the organization with folders. And, I agree with dovis and ivan regarding the sending replies and forwarding--it's confusing to me! I use the "getting things done" method to organise my emails and this means clearing my inbox and using folders. Its just how I work. I can't do that anymore!! I don't like the lables, I don't feel like I can use my inbox as a means of helping me know what task to do next. gmail is dependable and efficient, but I agree 100% it so damn confusing especially with replies and forwards. It has a messy feel to it. I prefer folders as well. A piece of paper with a bunch of stick it notes is sloppy. WE WANT MORE BUTTONS...and a preview below pane. Gmail needs a complete overhall. Archive Button Hard To Find. No Preview Pane. Why do we need to open an email before deciding on an action? I do not like using keyboard shortcuts, we NEED MORE BUTTONS to click and choose from. A simple version, for those looking to read, compose, and delete...done! Or the current advanced version for those that want to archive, label, star, converse, buzz, chat, labs, tasks, invite a friend, etc. etc. etc. etc. etc. 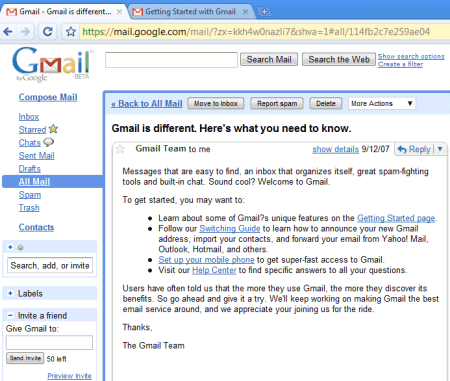 I have been using the Internet and email for about 10 yrs now but I have never been so confused as with using gmail. What is wrong with gmail?? It took me some 30 minutes to find the mail I received from a friend. This doesn't feel good! extremely frustrated. Now I have to find my important emails and star them for future access. I don't think it was like this back then. This is what I think, people try to improve their software or system but they mess it up altogether. The same thing is true with Yahoo. The majority of people including me does not want the new interface. But they try to force you to use it. "Sometimes old is best" is true. May be I will have the answers from the comments but I don't think I have the time for that.